C Couper. Bassoon: I Cowell. Saxophone: I Bunola-Hadfield, F Murphy, S Green, J Breene. Horn: F Robson, W Duckworth, O Holmes. 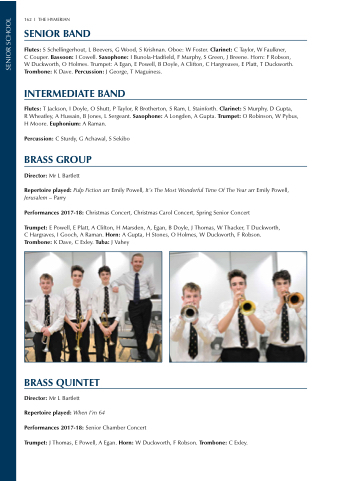 Trumpet: A Egan, E Powell, B Doyle, A Clifton, C Hargreaves, E Platt, T Duckworth. Trombone: K Dave. Percussion: J George, T Maguiness. R Wheatley, A Hussain, B Jones, L Sergeant. Saxophone: A Longden, A Gupta. Trumpet: O Robinson, W Pybus, H Moore. Euphonium: A Raman. Trumpet: J Thomas, E Powell, A Egan. Horn: W Duckworth, F Robson. Trombone: C Exley.